Following is a copy of our signed agreement and immediately below it (in case you can't read some of this picture of the agreement in the .jpg picture of it) is the original MSword document which was used to print the document that we signed. Below is the same agreement as above, except that certain of the most relevant sections have been highlighted in yellow. This is the complete AGREEMENT between Andy Blair, hereafter ANDY, [whose location information is via email at andybla@gmail.com, or cellphone 044 (415) 114 0113, or local mail address c/o La Conexion box#578B Libramiento a Dolores Hidalgo #11 colonia Independencia, or home address Camino a la Cieneguita 100km (there is no street address)] and Michael Wein, hereafter MPW, [whose location information is via email at mpwinsma@gmail.com, or landline phone is 415-152-2654, or local mailing address is c/o La Conexion box#77A Aldama#3 colonia centro, or home address is Suspiros #14 colonia centro]. Both ANDY and MPW agree to inform each other of any changes in any of the above location addresses during the entire course or validity of this agreement. MPW agrees to advance ANDY the sum of us$25,000 to be paid December 9, 2011. This is intended to pay off ANDY’s VISA credit card liability of about us$25,000, plus to save her the 20% interest on it each year (us$5,000 every year). In addition, MPW promises to charge no interest on the us$25,000 advance and MPW also promises to continue to charge nothing for the professional advice he offers to ANDY in matters of finance and time management. ANDY promises to pay off her $25,000 VISA indebtedness and to not use this or any other credit card, nor incur any other liabilities for any other extraordinary purchases of either goods or services in the future. ANDY also promises to provide MPW with copies of all future credit or debit card statements and all future bank account statements for, at very least, the next five years. These copies can be provided by sending him copies via email to his email address above. ANDY also promises to keep daily records which completely document her maintaining a balanced budget. 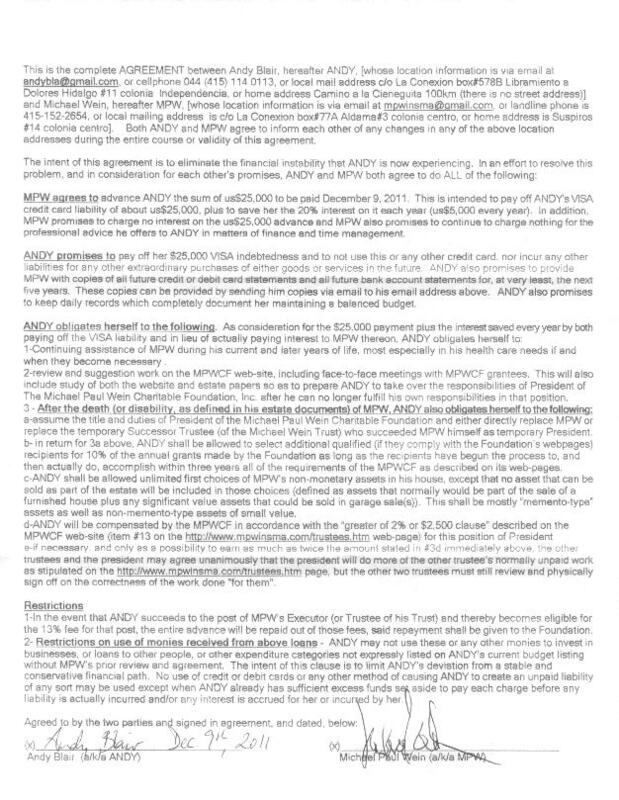 Note: the purpose of Andy’s continuing (for five years) obligations were to keep MPW apprised of Andy’s financial progress so that his professional services could be updated as the above information, plus updated copies of Andy’s budgets and weekly financial recordkeeping continued to be prepared and reviewed. This all started in Nov 2011..
1-Continuing assistance of MPW during his current and later years of life, most especially in his health care needs if and when they become necessary . 2-review and suggestion work on the MPWCF web-site, including face-to-face meetings with MPWCF grantees. This will also include study of both the website and estate papers so as to prepare ANDY to take over the responsibilities of President of The Michael Paul Wein Charitable Foundation, Inc. after he can no longer fulfill his own responsibilities in that position. a-assume the title and duties of President of the Michael Paul Wein Charitable Foundation and either directly replace MPW or replace the temporary Successor Trustee (of the Michael Wein Trust) who succeeded MPW himself as temporary President. b- in return for 3a above, ANDY shall be allowed to select additional qualified (if they comply with the Foundation’s webpages) recipients for 10% of the annual grants made by the Foundation as long as the recipients have begun the process to, and then actually do, accomplish within three years all of the requirements of the MPWCF as described on its web-pages. c-ANDY shall be allowed unlimited first choices of MPW’s non-monetary assets in his house, except that no asset that can be sold as part of the estate will be included in those choices (defined as assets that normally would be part of the sale of a furnished house plus any significant value assets that could be sold in garage sale(s)). This shall be mostly "memento-type" assets as well as non-memento-type assets of small value. e-if necessary, and only as a possibility to earn as much as twice the amount stated in #3d immediately above, the other trustees and the president may agree unanimously that the president will do more of the other trustee’s normally unpaid work as stipulated on the http://www.mpwcf.org/trustees.htm page, but the other two trustees must still review and physically sign off on the correctness of the work done "for them". 1-In the event that ANDY succeeds to the post of MPW’s Executor (or Trustee of his Trust) and thereby becomes eligible for the 13% fee for that post, the entire advance will be repaid out of those fees, said repayment shall be given to the Foundation. We, the individuals who are involved in TPOTRFOMPW, have gathered all of the information that appears on the various (and linked pages below it) webpages from conversations and other varied communications with Michael. As a matter of fact, he was adamantly against our publishing any or all of it. But we were too anguished by his constant reluctance to take actions quickly against this woman as well as his continuing protection of her in spite of what she did to him. We met often and argued often and finally overruled him and after publishing all of these pages, he finally agreed to at least read and comment on them and offer some major corrections and suggest many deletions, some of which we accepted. As these thoughts and words now approximately, and to the best of our ability, reflect his own words, they remain worded "in the first person". He also got us to eliminate certain things like the details and amounts on the budgets and the cashflow spreadsheets and we finally agreed that the "tops" of these documents were all we would publish at this time. We feel strongly that he has been "taken" by a greedy and malicious and immature woman who professed to be completely trustworthy to gain his confidence and trust and then she turned around exhibiting nothing of what she was before he helped her out of her very serious financial mess. Her true colors are now showing. We even provide evidence, something she ignored in making her own wild accusations unsubstantiated by her own words in the many emails we examined.